“This story is for all the slightly broken people out there. Pat warns his readers, in the Author’s Forward, that they might not want to but this book, that it is a strange story, and deals entirely with a side character from the Kingkiller Chronicles. It is a strange story, but it is strange as a result of all the perfect and beautiful ways one can use words. How one can look at a character and get so snug inside their head one starts to look at the world differently. It is a book that is hard to wake up from. You break out slowly, your head still thick with and tangled in words. It is beautiful and it is perfect. It is not a book for those looking for grand adventure, action, dialog. It is a novella that sneaks up on you, quietly draws you in and is loath to let you leave. A lot of that is Pat’s words- the way he plays with them, coaxes them into new configurations and meanings. Part of that is the character of Auri herself, enthralling, exceptional, unique, and so very broken. The Slow Regard of Silent Things is for anyone who wants to know more about Auri, not necessarily how she fits into the grand scheme of the Kingkiller Chronicles- you will not get plot advancement or hints here- but just…Auri. Herself. What she does and why and how she does it. It is a look at seven days of her life, in her head. And it is magnificent. It is, indeed, a strange story. But it is exactly the story I wanted. In a world where a great war devastated both human and Ferisher populations, the Ferisher Architect closed the paths between the mundane and fae worlds, stranding some Ferisher on the mundane, human side. Bloodlines mingled in a world changed by the Architects work, and humans with Ferisher blood, and Ferisher magic, exist alongside their mundane compatriots. It is in this world that Mikani and Ritsuko work for the Criminal Investigations Department. Ritsuko is the first female in the department, and determined to both earn her keep and prove her ability. Mikani is rough around the edges, and in possession of (possessed by) a bit of a uncanny second sight with proves useful on the job. A murder involving an obscene and intricate machine sets off an investigation that will turn the city Mikani and Ritsuko call home inside-out. From dance halls to criminal dens, they rush to solve the puzzle before the body count gets too high. Bronze Gods is a fantastic bit of steampunk, flavored with noir, that flirts with just enough romance to be subtle. The world build is an interesting one- the split between the straight human-blooded and those with a bit (or more) Ferisher in their lineage makes things interesting and has shaped a fascinating sort of culture for Aguirre to work with. Crisp prose and an engaging, enthralling plot keeps this one moving. Recommended. Earlier this year I had the privilege of reading Sovereign and The Offering, the two books that make up the Sovereign Series proper. Last month I was lucky enough to get to read Transgression, the prequel that promised to tell me just how everything happened. So I sat down, excited to get more background on the world, ready to cheer for familiar names, even as I prepared to boo and stomp for the usual suspects. Oh wow was I not prepared for this one. It takes a talented writer to turn a point of view so perfectly on its head while keeping so true to the story and the characterizations that were established, that the reader expects. Reluctant sympathy and compassion were pulled from me through the sheer skillfulness of how the history of the series was explained, described. Experienced. I cannot say I decided to like anyone I had already developed a dislike for- but I can definitely say I understand. And that is so much more powerful. Well played, Arroyo. Well played. There is nothing as brutal, as dangerous, as the desire to be loved. There will never be anything as complicated as family. In Transgression we get to see it all come tumbling down, shuddering in horror and from the terrible, tangible, humanity that started it all. Read it after you have read Sovereign and The Offering. It may be a prequel, but it packs a beautiful punch as a postscript. Regency England is divided into two worlds, that of the Ordinary that we are familiar with and the one of the Magi, filled with those who are graced with the gifts of the Gods. Persephone Fury is the youngest of a family graced with the gift of music, descendants of the man who originally pulled the Magi world from the Ordinary, to keep them safe. Apart from music that can twine through the soul, Persephone’s magic shifts and twists with shadows, something dark and unfamiliar, too strong and untamed for fine Magi society. But in a time of unrest, when the old Magi king steps aside in favor of a regent and both lowborn rebels and court Magi frantically try to use the prophecies of Merlin to support their cause, perhaps something a bit dark, a bit wild, is exactly what is needed. This Crumbling Pageant is an exhilarating blend of court politics, folklore, romance, and mystery- the threads all woven together into one expertly designed tapestry. Persephone is a balanced, intriguing, and honestly fun female protagonist. She is not the prettiest, she is not the tomboy stereotype, instead she is delightfully difficult to pin down and define. The whole Fury family breathes life into the setting, pulling the plot through its paces. Burroughs has also given us an antagonist we can hate with abandon and a sense of evil that will have you keeping a light on in the evening. This Crumbling Pageant has a bit of something for everyone. It is a brush of period fantasy with the trappings of a mystery/thriller, a bit of regency romance rolled in for a splash of color and a refreshing light flavor. It is a brilliantly unique and enthralling read. Highly recommended. Cori is free. She is free of Antius, where she had been raised and keep as a medical oddity and resource. She is free of all the experimentation and oppression. She is free to get to know Dylan. She is free to finally starting sorting out just who she is. If only everything else would stop getting in the way. The Antius citizens they managed to liberate are suffering from infection and a particular sort of withdrawal, keeping Mercy colony from dispersing before Antius can retaliate. The proposed solution is not something Cori is ready, or willing, to face. So she flees to The City and its efficiently feral inhabitants, seeking her friend Tyce and comfort away from expectation. Finding out she fits right in, and that The City boys are far from the overall hardened killers everyone assumed might not have been what she expected, but she welcomes it. It is a different sort of freedom in The City, and one she finds herself growing quite comfortable with as she grows a bit more comfortable in her own skin. But stories rarely end so easily. The threat of Antius and its armies looms large and when Tyce returns to The City he brings with him news of abduction and death. Learning more about herself,her parents and where she came from, and pulling together her City boys and colony allies, Cori will once more shoulder a world’s worth of responsibility and step into the line of fire. 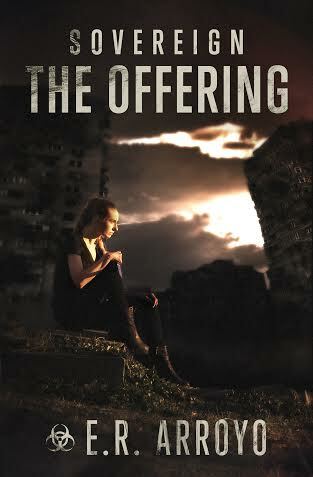 The Offering is the second book in the Sovereign series, and is a book that manages to walk that difficult balance of bleak and wonder with an enviable ease. Settled in the middle of a post-apocalyptic world where those that did not manage to hide were decimated or mutated during the disastrous event, Arroyo finds ways to work in the little things that remind us of what it is to be human, why the struggle is worth it- the smiles and small touches at the end. Little bits of wonder take a bit of the grit away when it is most needed- so while it is never a light book, it is never overwhelmingly oppressive. But most of all the characters will pull you in and keep you reading. Cori goes well beyond being a female protagonist I am proud to cheer for- she is relatable. Every sulk, snarl and snap along with every smile, smirk and sneer is wonderful and they combine into a perfectly imperfect young woman. I have a personal soft spot for the City Boys. Give The Offering a read and they will rope you in as well. So Many Authors so Little Time! December 10, 2013 2:28 am / 1 Comment on So Many Authors so Little Time! So, having just reviewed a book by Joyce Chng, I am pretty stoked to point out she has agreed to write a story for the anthology Christy and I are putting together. Earlier this year we successfully funded and published Fight Like a Girl (and have gotten some pretty swell reviews!). Our current project has a slightly different theme. If you would like to see who else is writing for the book, read more about what is going on, and help make this happen! Please check us out. I should know better than to start anything Joyce has written before bed. It guarantees I will be up long past my bed time. Happens every time. But oh, what a problem to have. Joyce has a way with words that makes mundane things like getting to bed early enough to be well rested for work tomorrow seem irrelevant, far away. As soon as I started Rider, I more or less knew I was doomed to be up with the sun, and I was quite alright with that. The desert world she brings us to, with its encroaching sands and talented Agri-seers working with plants to try and keep the dunes at bay and people fed, is so real and dangerous and engrossing and is peopled with characters that breathe and hurt and love. I was content to be held captive. Lifang has always been able to make plants sing, and so she ends up selected for the Agi-seers. But she dreams of being a Rider, like her sister- one of the humans partnered with the intelligent Quetz that were discovered with the planet. Humans have a partnership with the Quetz, a sort of understanding. But there are the Quetz, and then there are the Hunters, their wild cousins. And before Lifang leaves to join the Agi-seers she encounters a Hunter at a waterfall, and that encounter will change her life. One of the things that stands out most about Rider is the culture that Joyce has woven so tightly throughout this alien world she has created. The humans are rich with it, but so are the Quetz. One of Joyce’s strengths as a writer has always been her ability to make cultures sing out to her readers. Nothing is ever shallow or simple and it adds just an enjoyable beauty to everything she creates. Rider is a YA novel, but I would encourage adults to take it for a spin. Allow yourself to be captivated by a coming of age story that is as familiar as it is alien and let yourself grow along with Lifang.